EA shares did particularly badly yesterday in the wake of the publishing of its latest set of financial results. As MarketWatch observed, EA shares suffered their worst single day decline in over a decade, plunging 13.3 per cent on weak performance. You have to go back to Halloween 2008 to see a worse day for EA, when its stock value fell 17.9 per cent in one day. Behind the significant share price drop, shaving $3.7 billion off EA's market capitalisation, a number of issues were evident in the published financials, and were not helped by lowered forecasts. EA's largest release over the 'holiday season' (covered by this most recent financials report) was Battlefield V.
Battlefield V is an important game on PCs, where it has been a pioneering title for delivering real-time raytraced graphics and other Nvidia Turing technologies to PC gamers. It has even been in bundles from Nvidia as it is currently the best showcase for the RTX 20 range of graphics cards. However, sales of 7.3m units are a million fewer than expected. 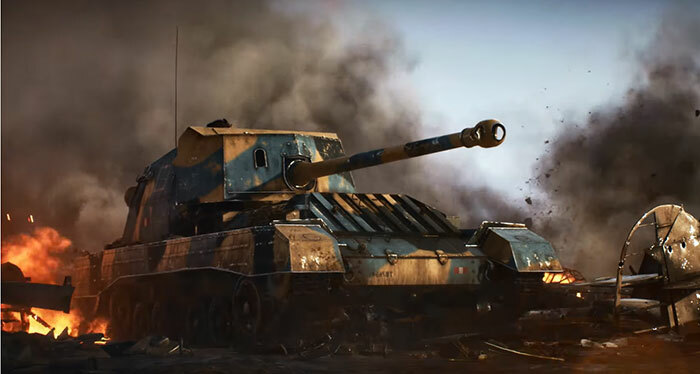 Alongside lukewarm reviews for Battlefield V, the game is thought to have been less popular than it could have been as it launched without its Battle Royale option (Firestorm is due to arrive in spring, as a free update). Furthermore, any sales achieved brought in reduced revenue as EA felt it had to cut the game's price to compete ahead of Xmas. EA Chief Executive Andrew Wilson indicated these were key factors in his firm's underperformance. EA's outlook is softer too. The firm is "very excited" with Apex Legends and the upcoming launch of Anthem. 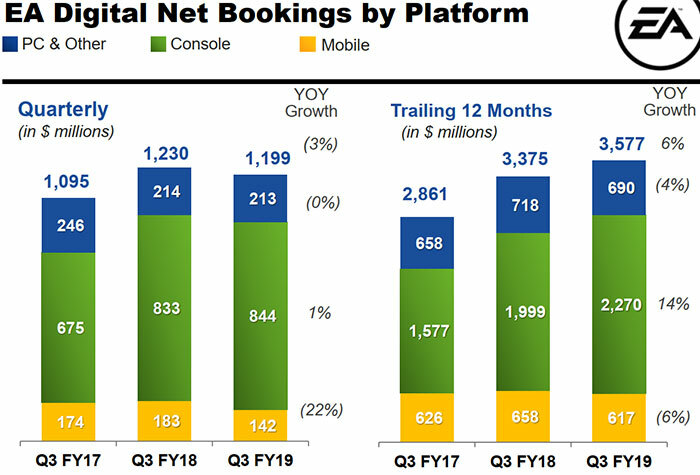 However, it expects weaker mobile gaming revenues; Command and Conquer: Rivals wasn't as strong as expected, and Madden Mobile tweaks failed to increase monetisation. Take Two also released its most recent set of financials yesterday. In brief, it beat its third quarter revenue targets following the huge success of Red Dead Redemption II. Shipments of this acclaimed game reached 23 million in its first quarter of availability. The game's online mode: Red Dead Online also performed strongly to contribute to the company's success. I can see Apex Legends doing quite well for itself, I played a few rounds and whilst it isn't really my thing I can see the appeal. To me it feels a bit like overwatch mixed with Black Ops 4's battle royal mode, which considering it is free to play isn't a bad thing at all; I enjoyed it more than fortnite but not as much as PUBG in its early days. I am hopeful that firestorm will be the first battle royal game I can really get into if it is more grounded like PUBG but far less buggy and quicker to play. I had a couple of rounds on Apex Legends last night - I'm of exactly the same opinion as you EC. Very impressed, very polished, runs well, looks great, mechanics feel spot on, excellent UI system (probably the best I've seen to be honest, really really great for ingame notifications to squad members) I like the special abilities. It's potentially a little too fast paced and twitchy for me, expect I'll stick with PUBG in the long run, but I'm defintely going to be giving it a few more goes. Easily beats Fortnite, I suspect we've reach ‘peak’ Fortnite and Apex Legends could take a good deal of it's player base given it's free. I am hopeful that firestorm will be the first battle royal game I can really get into if it is more grounded like PUBG but far less buggy and quicker to play. Apex has EAC as anti cheat and most cheat makers already stating they won't be making cheat for Apex because of the high maintenance costs of EAC anti cheat. DICE only has server side anti cheat and BF V is now overrun with wallhackers, you expect to have a good time in Firestorm you better hope DICE upgrades their anti cheat until then or else you will be owned. Cheat makers are boosting that their actual cheat code has not been detected since BF3 since there is ONLY is server side anti cheat, so only reckless players has been banned and those that are a little bit careful has been cheating undisturbed for years in since BF3. BF franchise is going under cuz of cheaters at the moment and meanwhile DICE blatantly lies that they investing heavy in anti cheat in BF V.
DICE stand at the moment is if you can't prove people are cheating they are not a problem even though the owning you and setting the whole gameplay off balance. Is Apex Legends pay to win or can you get weapons etc through playing? You clearly are not familiar with the Battle Royal mechanics/gameplay. Short answer: it's not p2w.